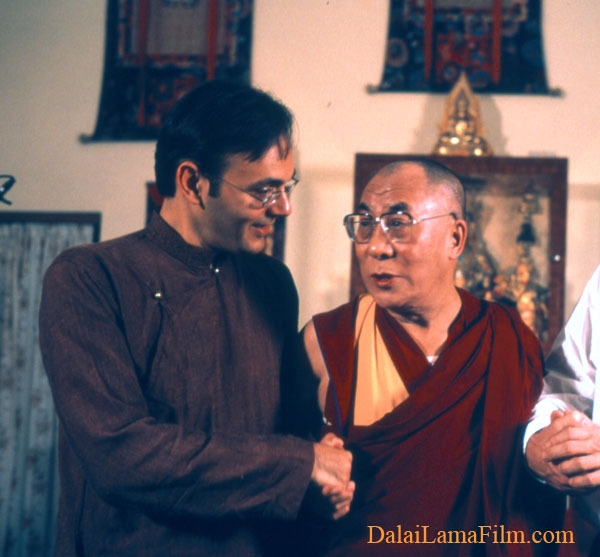 Producer-Director Khashyar Darvich with the Dalai Lama, during filming of "Dalai Lama Renaissance." After one of Darvich's interviews with him, the Dalai Lama commented: "Yes, I like your questions-- very good... Certainly, your efforts can make some contribution-- There's no doubt." Producer-Director Khashyar Darvich has won numerous awards for his documentaries and other projects that have been broadcast nationally, including on the History Channel, CBS, NBC and PBS. Khashyar strives and is committed to producing positive projects that are both artistically satisfying and that impact audiences in a positive and fulfilling way. In 2000, he founded and is President of a 501(c)(3) nonprofit foundation, “The Wakan Foundation for the Arts,” which has the mission of “serving and uplifting humanity through the arts.” Khashyar was committed to producing “Dalai Lama Renaissance” because of the unique transformation that occurred during that special event, and as it became obvious that what was captured by the cameras had all the elements of an extraordinary film. Some of Khashyar’s previous work includes: the History Channel and PBS award-winning documentary “Black Hawk Waltz: Tales of a Rocky Mountain Town,” about an eccentric Colorado mountain town, a true-life “Northern Exposure;” The “Coach Parks” documentary, about a high school coach who devotes himself to helping the poor, and who many professional athletes like Joe Montana come to for physical, personal and spiritual conditioning; “Saving the Redwood Forests,” a television PSA about saving the Redwood Forests that has won 15 awards to date; and other projects. After “Dalai Lama Renaissance,” he will be producing a documentary about “ordinary individuals doing extraordinary things for peace,” which will feature the remarkable stories of several prominent and inspiring people who are doing their part to create positive change. 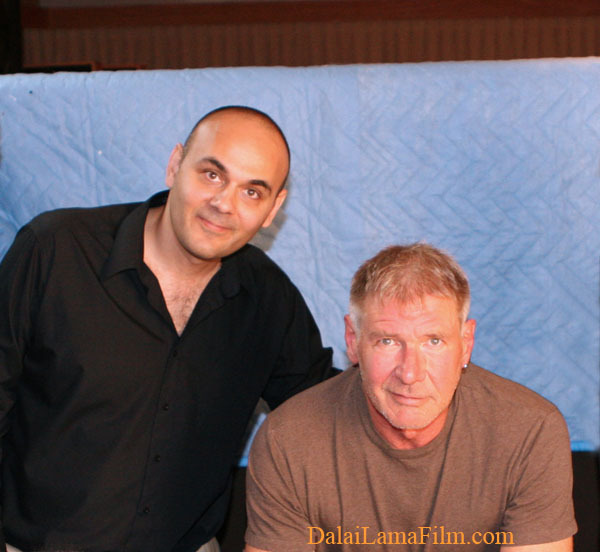 Khashyar Darvich with "Dalai Lama Renaissance" narrator, actor Harrison Ford. Khashyar Darvich was born in Washington D.C. in 1966, and then moved to the beautiful northern mountains and coast of Iran where he lived for four years. Even though he was young when he lived in the Caspian Sea region of Mazanderan (Iran), the lush nature, friendly people, and plentifual animals made a lasting impression on him, and gave him a deep respect and love of animals and nature. After moving back to the U.S. to Dayton, Ohio in 1970, Khashyar and his family again moved to Oxford, Ohio in 1972 when he was 6-years-old, so that his father (Djamchid) could begin a Ph.D. program in Political Science at Miami University of Ohio. Khashyar graduated in the top of his class from Talawanda High School (in Oxford) in 1984, where he studied drama and wrote and directed a one-act play, "The Coming of the Fish." It was in high school, that Khashyar began writing poetry and songs in his journal during slower periods in his classes. He also became a vegetarian at that time, because of the influence of a high school friend who was a vegetarian. "So far, you are the only student I can say this to-- You already are a poet; you will be published and read, appreciated, studied seriously; you will have books after you've published in many magazines and journals... Now all you have to do is keep reading, reading, reading, and writing, writing, writing." After he graduated from Baldwin-Wallace College in 1991, he then moved to Boulder, Colorado, to resume his writing, and worked for Toy and Game inventor Harvey ("Hank") Kramer, who invented the children's games "Mousetrap" and "Toss Across," as well as having sculpted the horse logo for the Mustang car, and invented the character "Mr. Clean." Hank had multiple sclerosis and could not move his arms or legs, and Khashyar acted as a personal assistant, and marveled at Hank's incredible stories of meeting Howard Hughes in Los Angeles at a private party, being a rodeo cowboy, a professional sculptor, and working as a toy inventor. After Khashyar worked for Hank Kramer, in 1992 he studied Creative Writing at the University of Colorado, as well as taught Creative Writing to undergraduate students. But he wanted to pursue his writing outside of the structured environment of a University, so he continued writing on his own, and began working as a news reporter in the Colorado Rocky Mountains. Although Khashyar loved the deep personal expression of writing poetry (which spoke to his soul), he also felt a deep calling to reach out to a wider audience than his poetry would allow him to. So, he began writing screenplays, beginning with his first, "Many Hidden Fires," a Native American Western infused with Native American mythology, spirituality and culture. During the time he was writing on the script (in 1993 and 1994), he decided on the name of his film production company, "Wakan Films," which he would use as a vehicle to produce his scripts. Wakan is the Lakota Native American term that means "in the spirit of the Great Spirit (i.e., God)," or "having qualities of the Great Spirit." Khashyar had an inner belief that it was important to use the creative opportunities that he was given to serve Humanity and the Greatest Good. Darvich contacted actors who he felt might be right for "Many Hidden Fires," and sent "Many hidden Fires" to Country Music Legend Johnny Cash, who read Darvich's script one weekend at his weekend cabin in Tennessee. Johnny Cash liked his script, and expressed interest in playing one of the roles in a film, if the project received funding. It was during this time, that Johnny Cash released his highly acclaimed acoustic album "American Recordings," in 1994, which would launch a resurgence of his career. But Darvich had a difficult time raising money to turn his script into a film. About this time, as he was writing news stories as a newspaper report near the small Colorado mountain town of Black Hawk, Colorado, that he came up with the idea of producing a documentary film about the quirky history of Black Hawk, Colorado (about one hour west of Denver), which had an interesting and eccentric population, and which was dramatically changed after the introduction of gambling to the former gold mining town. It seemed that everything came easily on the Black Hawk Documentary. While waiting for a connecting flight to Los Angeles, where Khashyar was going to have his "Many Hidden Fires" script read by Hollywood actors, he saw another man sitting on the carpet of the airport gate also reading a film script. Khashyar introduced himself. That man was documentary Producer-Director Dennis Aig, who had worked on two documentaries about Robert Redford's films: "A River Runs Through It," and "The Horse Whisperer." Darvich was right that Aig's Documentary film experience would help in raising money for the Black Hawk Documenary, and a few weeks later, they received over $100,000 to create the feature-length documentary film "Black Hawk Waltz: Tales of a Rocky Mountain Town," which in 1996-1997, was broadcast several times on the History Channel and PBS stations, and won several awards. Darvich continued writing film scripts, including "Farewell to Rumi," about an Iranian-American family, Sufism and poetry, which is based mostly on Khashyar's experiences as a youth while growing up in Ohio, and wrote 5 scripts in all, one novel and hundreds of poems. But as more documentary work came his way, he realized that perhaps he was meant to produce and direct documentary films, so he began focusing his energy on documentaries. He moved to the San Francisco Bay area of Northern California, and met fellow filmmaker David Mueller, who he felt a connected with in regards to having a positive social purpose in filmmaking. In fact, by this time, Darvich believed that it was only worth putting his energies into filmmaking, if the projects that he produced and directed were uplifting and have a positive message, as well as being artistically compelling. Through Darvich's "Wakan Films," Darvich and Mueller worked on a documentary about peace (in which Darvich interviewed the well-known poet, director and author Dr. Maya Angelou, Western actor Dennis Weaver, His Holiness the Dalai Lama, author John Robbins, as well as others). When interviewing Dr. Maya Angelou (who is a Tony, Emmy and Pulitzer Prize nominated author, actress and director, and who wrote a poem by request for the inauguration of President Bill Clinton), Darvich mentioned to Angelou that he stuttered for most of his life. Angelou mentioned that her brother also stuttered. Khashyar has spoken with a stutter for most of his life, but has achieved what he has wanted, including teaching creative writing at the University level, reporting, and producing and directing films. He has has seen it as a blessing because of the many things that he has learned as a result of it, like to communicate clearly through written words, to accept others, and that human beings have the unlimited capacity to create and achieve what they are inspired to in life. He believes that nothing can stop a person who is determined, and that inner vision, clarity, drive, and working with spiritual truth are the most important factors in achievement. He, with Director David Mueller, also produced a television piece about "Saving the Redwood Forests," which was aired on national television and won several awards, as well as a documentary film ("Coach Parks") about an inspiring high school coach (coach Ben Parks) who also devotes himself to helping the poor, and trains the minds, bodies and spirits of professional athletes like San Francisco 49 legends Jerry Rice and Joe Montana. In 2000, Khashyar decided that the best way to support the positive projects that he wanted to create was to Produce films under a non-profit foundation, so he established a non-profit 501(c)(3) foundation, "The Wakan Foundation for the Arts," which has the mission of "serving and uplifting Humanity and the Greatest Good through the arts." One of Darvich's friends who he had interviewed for a past project, author Jerry Jampolsky, was invited to attend a conference in Dharamsala, India with the Dalai Lama about solving some of the world's problems. The organizers of the event needed a documentary crew, and Jampolsky recommended Darvich and Wakan Films because of the spirit with which they worked while filming and interviewing Jampolsky. Darvich and Wakan Films was offered the Dalai Lama documentary project 8 weeks before they would need to travel to India, and so Darvich found an inspired and professional film crew from the San Francisco area that committed to traveling to India and work 14 hour days to capture the event. The 140 hours of video footage that the 18 person 5 camera film crew captured developed into Darvich's current documentary, "Dalai Lama Renaissance." "Yes, I like your questions-- very good... Certainly, your efforts can make some contribution-- There's no doubt." Darvich believes that everyone has their purpose and path in life, and to be truly fulfilled, we must search within ourselves in our quiet inner space and discover our purpose. Darvich believes that his purpose in life is to serve Humanity and the Greatest Good through filmmaking. Khashyar is also editing a companion DVD for "Dalai Lama Renaissance," which contains the best of His Holiness the Dalai Lama's talks during the "Dalai Lama Renaissance" meeting. "Dalai Lama Renaissance" Music Producer and Sound Designer Michel Tyabji is Producing a companion soundtrack CD to the film, which is expected to be released also in 2007. After "Dalai Lama Renaissance," Darvich plans to produce a documentary about ordinary individuals who do extraordinary things for peace, and also another special documentary about the American side of his family, using 6.5 hours of family home movies from the late 1930s until the late 1960s. Khashyar is open to other offers and suggestions of powerful, life-affirming film projects that serve the Greatest Good. Khashyar lives in Hollywood, California with his African Grey parrot "Bodhi," who can already say "I love you," "Hello" (with both an American and European accent), "Bye bye," "Kiss ("mwaa, mwaa"), "come here," and "No, Bodhi, no," and other cute things. 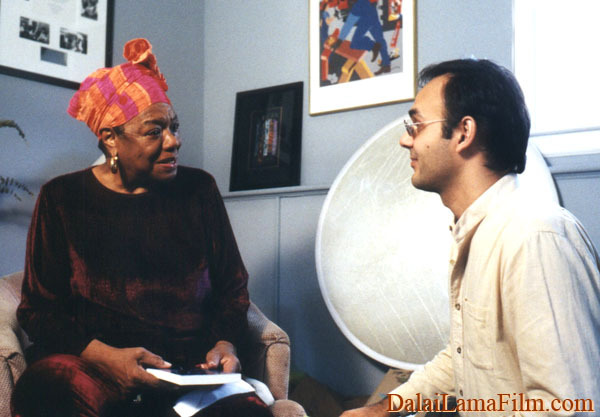 Darvich with Poet, Director and Author Dr. Maya Angelou, during an interview he conducted with her for a documentary film about peace.